Exploring extraordinary places and creating memories that will last a lifetime – it’s just another day in WA. Sharing a coffee on the pristine white sands of Lucky Bay near Esperance with resident Kangaroo’s. Learning how to catch and cook mud crabs with a local Aboriginal guide, as the sun sets on the Dampier Peninsula near Broome. Jumping on board the Insta-trend and to taking a #quokkaselfie at Perth’s island paradise -Rottnest Island. Stepping off the shore to explore World Heritage listed Ningaloo Reef with a turtle as a personal tour guide. Exploring the ancient caves of Margaret River with a spell-binding digeridoo experience. Don’t wait another day, book your journey to WA with Expedia today. Endless sunshine, pristine beaches and great food and wine – there’s nowhere quite like Perth. A city nestled in nature; you’ll find something different in every direction, with many of Perth’s famous beaches, wineries, car-free Rottnest Island or swimming wild dolphins within easy reach of the CBD. Margaret River is where rolling vineyards sit against a backdrop of ocean, forest and caves. Blessed with mild weather and abundant sunshine, adventurers will be blown away by breathtaking scenery and out-of-this-world walking trails – all just a three hour drive south of Perth. One of the last true wilderness areas on Earth – an epic landscape, more than 2 billion years in the making which holds so many stories of the oldest living culture on Earth. Fly to Broome, with daily direct flights from Perth or seasonal direct flights from Melbourne, Sydney and Brisbane. Enjoy a sunny beach holiday at any time of the year. Discover some of the world’s most biodiverse marine habitats offering extraordinary encounters just metres away from the pristine beaches. Fly to Perth, then grab a connecting flight to Exmouth, or hire a car and discover some of the best of WA’s coastline including the famous Monkey Mia. Under vast outback skies, prepare to be inspired by the seclusion and beauty of Esperance. Unearth another side of the landscape and embark on the road trip of a lifetime by hiring a four-wheel drive and hitting the red dirt highways. Drive yourself for a unique adventure through the outback and see the ethereal Wave Rock, carpets of wildflowers and kangaroos on the beach. 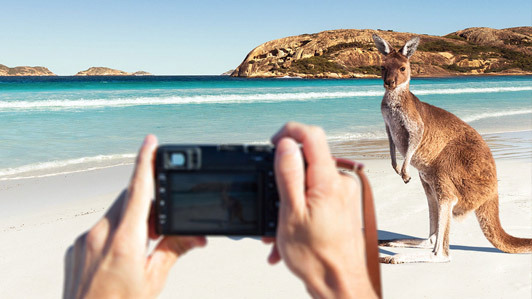 Fly to Perth, and grab a hire car, fly or join a tour to experience the outback and Esperance.